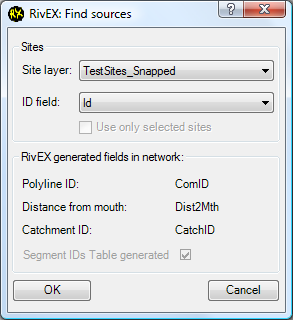 •In this section you are going to attribute the network with more information, extract out catchment topology information (in RivEX this is referred to as the segment ID table) and then use these to query the network to find the sources of snapped sites. A snapped site is a point that has been moved such that it overlays the network. 5.Tick on Catchment ID and Downstream length. Click on OK to execute the tool. RivEX will report its progress in the progress panel. 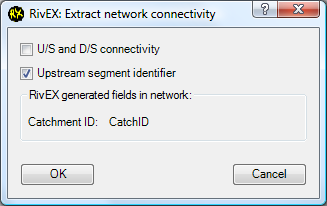 6.With RivEX still open, un-tick "Run network attribution tools", expand Analyse network and tick on "Extract network connectivity" then press Run Tool to open the Extract network connectivity dialog. 7.Tick on Upstream segment identifier and click OK to continue. 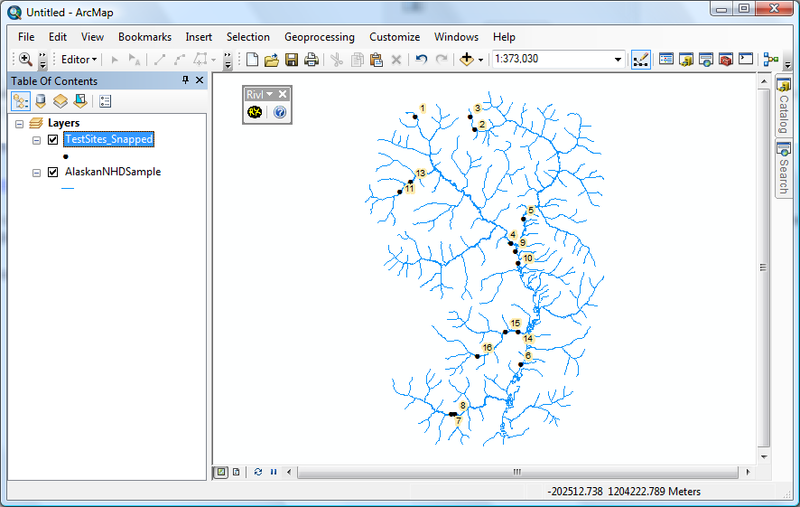 8.RivEX will create a GeoDatabase and populate it with tables, one for each catchment. 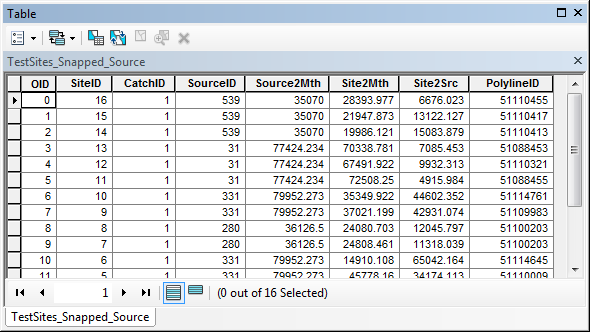 As the sample data is only a single catchment then a single Table is created. VERY MPORTANT – These tables are used by many of the processing tools. 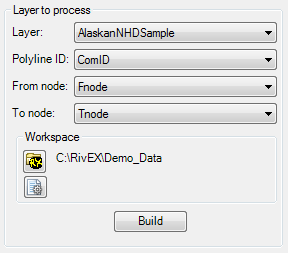 RivEX will build links to these tables based upon the layer name and polylineID field. Do not change the layer name or use a different ID column (e.g. you built the segment ID tables based upon comID but for some reason you start using the FID column) , also any editing to the network will mean the segment ID tables will become out of sync with the network and must be rebuilt. If you forget which ID field you were using, then look at the settings file. 9.Close RivEX dialog down and load the point dataset C:\RivEX\Demo_Data\TestSites_Snapped.shp. In the image below the default symbology has been changed and the sites are labelled with their ID. 10.Re-open RivEX and complete the layer to process panel as described in steps 2 and 3 above. 11.In the Tools panel, expand Site processing, tick on "Find source for site" and then press Run Tool. 12.Complete the dialog as shown below and click on OK to execute. Note the generated RivEX fields are all pre-set, RivEX was able to determine these existed from the settings file. 13.Allow RivEX to add the table to map document. Change the Table of Contents to List by Source mode to see the table (TestSites_Snapped_Source). Right click on the table and open. A description of each field is listed in the table here.